We are a small family run cattery, offering lots of cuddles (all diets catered for). We are fully insured and licensed by Reigate and Banstead council. 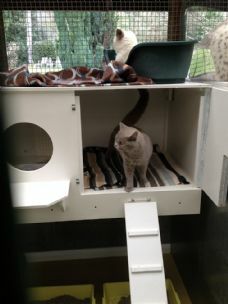 I have been using Banstead Cattery for at least two years, I wish I had found them before. My cat loves Brian the owner he always settles in straight away. The pens are clean and very roomy and I know my cat Felix is being looked after, I recommend this cattery if you want a happy cat. Our elderly rescue house cat, Frazzle, stayed here for a week, and we were very happy with the service she received. She's quite a hair ball, and came back all smooth and happy and even seemed relaxed! I recommend, and will use again.